Humans aren’t designed to sit for long periods of time. According to a meta-analysis involving over 800,000 subjects, people who sit the most have a 2-fold increase in diabetes, 2.5-fold increase in heart disease, 90% higher risk of death from heart disease and 50% higher risk of death from all causes compared to people who sit the least. There are many desk jobs in modern society. Given the alarming increase in disease that accompanies sitting all day, these 3 health tips are well-worth implementing. 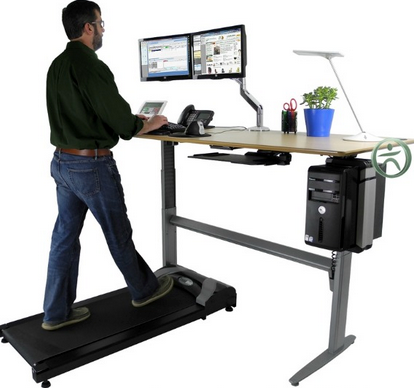 Give your workstation a makeover and get a treadmill desk AND/OR standing work station. Take breaks: Get up and stretch every hour even if it’s for 1 minute (you can set a popup reminder on your computer calendar). Getting up to get some water will help prevent dehydration, boost circulation, and get you off your booty. So sitting is bad for you. Guess what else? Too much bright light and blue light ESPECIALLY after the sun has gone down. Light disrupts melatonin, which is a powerful cancer suppressor. Work when it is light outside and limit or eliminate evening screen time. If for some reason this isn’t an option, install software to dim your computer screen so blue light doesn’t interfere with sleep as much. Unfortunately, the apps for iPhones and iPads only work if you jailbreak your phone. However, you can dim the brightness on most devices. Having more time spent in the dark after the sun goes down helps balance hormones, trim fat off your waist, and could even reduce your appetite and cravings (especially at night). Specifically, we need darkness to make Vitamin D, melatonin, and reduce levels of prolactin and cortisol (both of which increase hunger, cravings, blood sugar levels, and fat deposition). When melatonin is low and prolactin high–the adaptation that happens when we get lots of light at nighttime-the hormonal switcheroo decreases leptin (the hormone that tells us to stop eating) and increases neuropeptide-Y (the hormone that tells you to keep eating). The great thing is that when you dim or turn out the lights at night, the increase in melatonin production will make you sleepy so you’ll go to bed earlier and wake up earlier. So really, the computer time you’d spend at night can be traded for morning screen time…and you’ll be healthier to boot! In our modern, tech-addicted world, it is easy to forget that we are designed to move around and not have constant access to light and food. For millions of years, we evolved under very different circumstances. 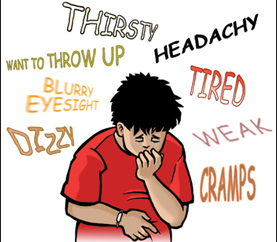 Considering this, it isn’t surprising that our bodies are more disease prone when we violate these fundamentals. Taking some initiative to “get back to our lifestyle roots” is the next step in our survival. Keeping blood sugar levels consistently in the 80-89 mg/dL range is associated with all kinds of health benefits including lower risk of heart disease (lower triglycerides, fewer small LDL particles, improved HDL), diabetes, less belly fat, normal blood pressure ranges, and more. Some clinics have adjusted their “acceptable blood sugar ranges” to reflect the mounting research that blood sugar levels over 90 mg/dL is a biomarker for coronary heart disease risk. Whether you are eating wheat or a gluten-free alternative, virtually all bread has a significant increase on blood sugar levels. Amylopectin A, the starch in wheat, raises blood sugar more than table sugar. Gluten-free flours such as tapioca starch, potato starch, cornstarch, and/or rice starch are also awful for your health and jack blood sugar levels up. 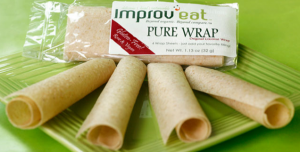 Meat: roll it up and eat it by itself or use it to roll up cheese, bell pepper, tomato, etc. The only way to ensure that your blood sugar levels stay within the awesome range of 80-89 is to test! A simple glucometer is inexpensive (under $20 usually). I recommend testing yourself upon waking and then again an hour after breakfast. If your levels rise above that 89 mark, you’ve got some adjusting of your carbs to do (protein and fat aren’t going to raise blood sugar or insulin levels much, if at all). Experiment with different breakfasts until your levels are within that awesome range and then proceed to testing your levels at lunchtime and dinner, following the same steps as you did for breakfast. If you get overwhelmed, take a couple days off and take some deep breaths, but don’t give up. It is unfortunate that our food supply has gotten so unhealthily out of hand that it is making us sick or killing us–that’s not your body’s fault. 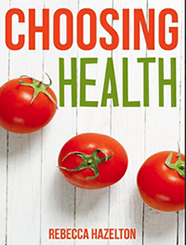 Learning how you can eat delicious foods that don’t make you sick and spike your blood sugar is worthwhile and could very well save your life. 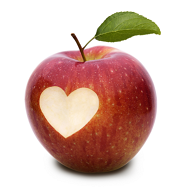 For plenty of blood sugar balancing recipes, click here. I’m not gonna lie: I LOVE chocolate. I eat it almost every single day and I consider it to be a contributor to my great health. In order for me to give chocolate a thumbs up, however, I’ve got some standards. 2. Short ingredient list (with easily identifiable, quality ingredients) AND no soy lecithin. Soy lecithin is an emulsifier and so is used to enhance texture, but who are we kidding–soy is in friggin’ EVERYTHING. 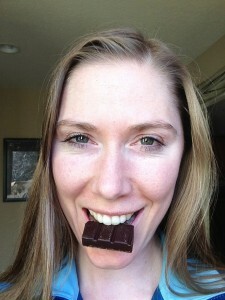 I don’t want it in my chocolate and I don’t find that soy lecithin-free chocolate is lacking in great texture. Avoid chocolates made with Dutch cocoa (they use some nasty chemicals to make this & the process reduces the antioxidants by half), preservatives, and/or trans fats. Alter Eco, the Dark Blackout 85% is my fave! Lindt, because you can get it almost anywhere & they offer plenty of high cocoa content options…and it is super tasty. 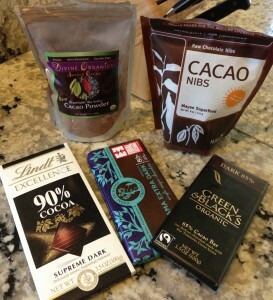 However, double check the ingredients (the 90% cocoa one has Dutch cocoa, which drastically reduces the antioxidant load). Before digging out your old cookie recipe that’s full of sugar and flour that’ll send your blood sugar through the roof (and make you more likely to catch whatever nasty cold is going around), consider this: A completely healthy cookie recipe that TASTES just as delicious….maybe even more delicious. Send your excuses packing (i.e. “I don’t make cookies that often so I’ll just eat the “good ones””, “Those healthy cookie recipes aren’t as good”) and kindly stop and listen. You can enjoy delicious tasty treats that are also good for you. This recipe, modified from Maria Emmerich’s Nutritious and Nutritious Journal, is a great way to start! 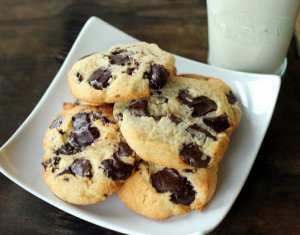 3 ounces of your favorite chocolate, chopped into chocolate chip sizes. I used 1/2 bar each of Lindt 70% cocoa and Lindt 90% cocoa. You can also used ChocoPerfection Bars which are sweetened with chicory root. Cream butter in large mixing bowl with electric mixer. Add egg, vanilla, and sweetener and blend thoroughly. Roll dough into tablespoon sized balls and push flat (3/4 inch thick) on parchment paper covered cookie sheets.